Elegant and dazzling for your darling! 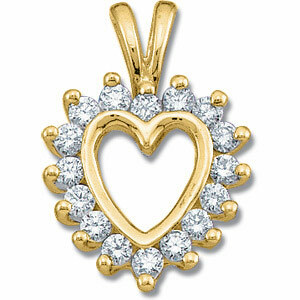 Diamond heart pendant is made of polished 14kt yellow gold. Item size: 1/2in x 1/2in without bail. Diamond details: 16 .02CT full cut round faceted diamonds. Prong set. Diamond clarity I1, color GHI. Weighs 1.83 grams. Please note: weight is approximate, actual weight may vary. Chain not included.